Rohan kini is on a year-long-sabbatical from his job at Thoughtworks, a Bangalore-based IT Consulting firm. And this break is not to enhance his educational qualification, but to give time to his bicycle store, Bums on the Saddle, which he began five years ago along with his friend Nikhil, a mechanical engineer who works with the BMW group. I used to commute to work on my cycle, 22 kms in a day for quite some time as the traffic in Bangalore really got to me, says Kini, who also began the Bangalore Bikers Club (BBC) after he discovered the joys of commuting on the cycle. What began as a small initiative has grown up into a full-fledged enterprise and a constantly evolving group with BBC having around 3,000 members. While a number of cycle lovers do find the cyclothon a fun exercise to popularise the sport, the serious cyclists eye the long distances. Rohan is just one of the growing number of cycle enthusiasts who have taken to this eco-friendly and healthier way of transportation that is catching on fast with the masses. Cities like Bangalore, Pune and Mumbai have seen a sizeable growth in the number of cycle users over the last couple of years. 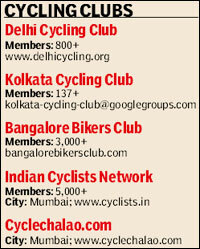 Though a popular sport in the global arena, cycling in India, and that too for commuting is not that popular. Its still not a high-class indulgence, says 45-year-old Anita Roy, commissioning editor at Young Zubaan, a Delhi-based publishing house, who cycles to work as its the most practical form of travelling. Having grown up in England, Roy moved to Delhi 16 years ago, but found it settle down in the city owing to the traffic woes and the constantly rising pollution levels. People used to drive for even short distances and I didnt want to be one of those who added to the growing motor population, says Roy, who sold her car to a vegetable vendor and bought a bicycle. But isn't it unsafe to ride a cycle on Delhi roads, especially being a woman Woman on a cycle gets a far better treatment. Ive had people smiling, encouraging and appreciating me when I'm on the road, says the feisty woman, who rides a basic gearless Rajdoot Ranger. While Roy finds travelling on cycle a better way to connect with people, there are others like 44-year-old Pune-based Divya Tate who found cycling a solution to all her work woes, be it home or office for the last 20 years. An architect by profession, Tate has found cycle as the most convenient form of travel to her work site, office or to even run errands. She is currently preparing herself for the 1200 km Paris-Brest-Paris cycling event that is held once in four years in Paris! A cyclist needs to complete a 200, 300, 400 and 600 kms endurance ride to be eligible to apply to the Paris event. And having cycled from Pune to Rajasthan on her cycles, Tate finds the attitude of people towards the Indian manufactured cycles extremely snobbish. These dont make people hip and happening. Its just because of the foreign brands that people want to adopt this eco-friendly travel medium and sport, she adds. Tate, who is an active member of the online community www.cyclists.in has seven cycles at her Pune residence. My kids too love the sport, she adds, pointing out the fact that the cycle movement has grown exponentially in the last one year. Mumbai, Pune and Bangalore, owing to relatively better weather conditions, have seen a growing number of cycle enthusiasts. Mumbai-based Vinaya Patole has been exploring the streets of Mumbai on her cycle. Ive completely stopped using the public and private transport. Its such a waste of time to be stuck in traffic. Saves me the hassle of crowded trains and the expensive taxi rides. After all, in Mumbai, everyone, from the dabbawalas to the local milkman use this mode of transportation, says Patole. Another Mumbaikar Anil Uchil, who has been cycling to work since 1993, is the man behind www.cyclists.in. Hes had clients and colleagues laughing at him. But there have been times when Ive reached before them. My clients now suggest everyone to start cycling, as thats the best way to commute in Mumbai, says Uchil. Sanjay Tripathy, an executive vice-president at HDFC Life, who is a casual cyclist himself, has seen the growth the mode has seen in the last couple of years. HDFC Life is the associate partner of the India Cyclothon and will be sponsoring cycling helmets for the participants. Though cricket enjoys the maximum popularity and even money is involved, one cant ignore any more the health and environmental benefits cycling promotes, says Tripathy. While there isnt a great deal of money involved in the sport, but various different models of cycles available in the market do cost a mini-fortune. And that is one of the reasons why people are a little sceptical to invest in cycles, says Kini. But not all shy away. His Rs 30,000-mountain bike has just completed a month in his home. But for the 27-year-old sports enthusiast, who started riding a bicycle to reach his table tennis academy in Bangalore, is ready to spend another Rs 70,000 to get the latest edition of his mountain bike. A member of the growing community of bicyclers in the BBC, Viju Varghese, an assistant marketing manager with John Distilleries, used to cycle to work till about a month back before he got promoted. I have to visit different locations daily, and bicycling becomes difficult, says Varghese. But it hasnt changed is his passion for cycling despite having to lug it up and down twice a day from his second floor residence. A regular with his two-hour training sessions daily, morning and night, Varghese participated in Tour of Nilgiris 2010 (TFN 10) in December. Another Bangalorean, 26-year-old Rohitash, working as a research officer at Natural Remedies has been cycling 26 kms every day for over a year now. He owns a RockRider 5.2 worth Rs 20,000 and wants to upgrade to a higher version soon. I had never imagined myself cycling for every job that I do when I was living in Delhi, says Rohitash. And people like them have been source of inspiration to others as well. Delhi-based Abhishek Krishna, working in the hospitality industry for the last four years, has got one of his colleagues to buy a cycle. A member of the Delhi Cycling Club, Krishna began with a road bike two years back but now has graduated to a mountain bike worth Rs 42,000. It is a challenge to manoeuvre through the traffic on Delhi roads. Though my office is just 5 km away from home, speeding vehicles and lack of dedicated cyclist lanes make it really tough, says Krishna. Though most cycle enthusiasts are handicapped due to lack of better infrastructure like roads and parking facilities, the passion of cycle aficionados is fuelling the pedal movement. Both Varghese and Rohitash are heavily into long distance races and mountain biking. And their group BBC, like others across cities like Delhi Cycling Club, organises different events for people with varying cycling pursuits. Every month, ideally on the first Sunday, long rides are organised by BBC for people pursuing cycling for the spirit of exploration. And as the cyclothon draws Pune residents out on the streets, the success experienced at Bangalore and Mumbai has only shown the love of the masses for the common mans vehicle.